Visitors to the Okanagan are always impressed by the clear blue water of our valley lakes, but 40 years ago, lakeshore residents were selling their property because of the smelly, polluted and algae-filled water conditions. It took a major public outcry and investment to turn the situation around. Prior to the mid 1970s, most municipal wastewater was treated by secondary processes where sewage microorganisms were cultivated and added to the wastewater to remove dissolved organic matter. The microorganisms absorbed organic matter from sewage as their food supply. The treated residual was discharged to the lakes or the Okanagan River channel. Secondary-treated wastewater contains high levels of nutrients; typically nitrogen and phosphorus. Excess release to the lake environment leads to a build up of nutrients, called eutrophication, which in turn encourages the growth of rooted weeds, algae, and cyanobacteria (a species of blue-green algae that can be toxic in drinking water). 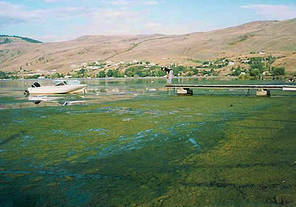 Blooms of algae occurred in Vernon, Penticton, and Kelowna in the late 1960s. At that time, lakes were typically regarded as giant dilution reservoirs into which pollutants and waste could be readily disposed with no discernible adverse effects (an approach known as “the solution to pollution is dilution”). The smaller the receiving water bodies, the quicker problems developed. With increasing population, the ‘reservoirs’ soon became undersized and the impacts of nutrient rich wastewater could no longer be ignored. Eutrophication of lakes is not a new phenomenon. Over the lifespan of a lake, eutrophication occurs naturally as the lake fills in, gets warmer, and receives more nutrients from silt input during run-off. Small plants and organisms that flourish under these conditions provide food for fish, amphibians, and many other creatures, all of which are vital for the maintenance of the natural balance in the ecosystem. Eutrophication of a large lake such as Okanagan is a slow process, unfolding over centuries or even millennia. There is no doubt that man’s contribution has accelerated this process. 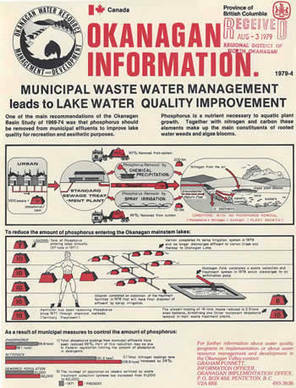 The Okanagan Basin Study of 1969-1974 identified municipal sewer outfalls as the primary source of excess nutrients in the lakes, and local governments joined forces to make advanced tertiary treatment the standard in the Okanagan. Tertiary treatment involves nutrient removal from the final treated effluent, and is sometimes referred to as “water polishing”. The valley’s sewage treatment plants were forced to adopt a new level of technology, and Okanagan communities were faced with the considerable cost of building and implementing advanced wastewater treatment systems. Community leaders in the valley’s three regional districts recognized the lakes as a regional resource and opted to levy a tax on all properties within the Okanagan watershed to fund the restoration and maintenance of water quality. The Okanagan Basin Water Board initiated a grant program to assist communities, especially those with smaller tax bases, in building expensive advanced treatment systems, funding up to 18% of the cost of treatment and collection system infrastructure. Although potentially effective, chemical methods used to precipitate out nutrients in the wastewater were difficult to balance and maintain at adequate performance levels. Local governments examined a new process known as BNR (biological nutrient removal) that had been successful in other parts of the world. In this process, bacteria known as “polyphosphate accumulating organisms” acquire large quantities of phosphorus within their cells. When these nutrient-enriched bacteria are separated from the treated effluent, the resulting wastewater is of much higher quality than that produced through secondary or tertiary treatment without the ‘polishing’ process. The first tertiary treatment plant in the Okanagan was built in Kelowna. After a difficult start-up and learning process, the plant exceeded the criteria for the reduction of nutrient loading. Over the next twenty years, other communities followed, building a total of nine state-of-the-art treatment systems. While some communities chose the BNR route, others opted for land disposal of treated wastewater. It took some time to tailor wastewater recycling to Okanagan standards and climate conditions. In 1978, Vernon was the first community to direct all treated sewage back to the land through spray irrigation, and Osoyoos implemented a similar system soon after. The expenditures made on nutrient removal technology resulted in a decrease in phosphorus input into the lakes from 59,000 kg in 1970 to less than 1000 kg in 2003. Sewage treatment facilities are not the only cause of water pollution in Okanagan lakes. Numerous properties serviced by septic tank and tile field systems also contributed substantial amounts of nutrient-laden wastewater to the lake system. As growth flourished, so did the number of these systems. The extension of community sewers to these properties became another focus of the Okanagan Basin Water Board grant program. Over the past twenty years, the Okanagan Basin Water Board has assisted ten communities, providing more than $40 million in funding for the upgrade and replacement of sewage treatment facilities and the extension of community sewers. The success of this program was a direct result of valley-wide cooperation. Improved sewage disposal in a single area in the Okanagan would not have restored the health of the valley’s lakes throughout the basin. This type of coordinated program may well prove to be a model for addressing other emerging regional water management issues.